Cabrera Capital Markets' Debt Capital Markets group underwrites corporate debt and asset-backed securities. The firm is primarily involved in investment grade, high yield, preferred shares and asset-backed securities underwritings. Our model provides clients with new sources of demand by effectively penetrating second and third tier investors that may be overlooked by large firms. We also cover large accounts to complement a large and diverse investor base. As an underwriter of corporate debt, we provide our issuer-clients with insightful market coverage and ongoing market pricing analysis. 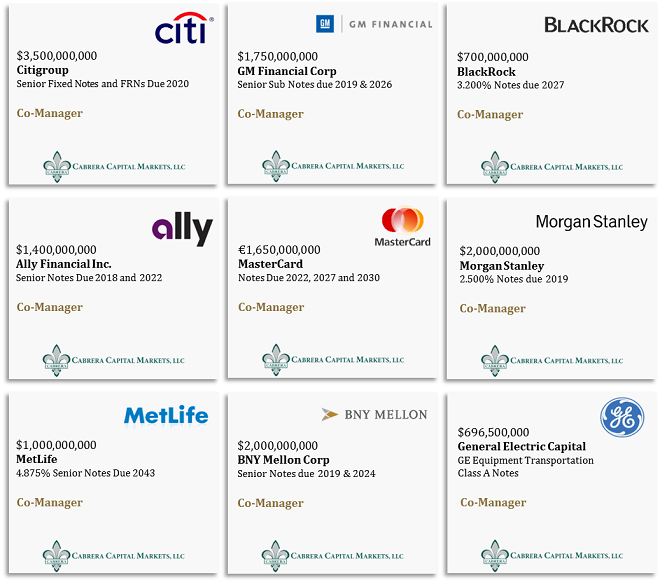 Following are recently priced debt offerings we have participated as a co-manager, among others. 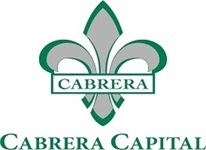 Since establishing its debt capital markets platform in 2004, Cabrera has worked on behalf of numerous corporate clients as co-lead manager and co-manager. Following is a description of a transaction that our group co-lead. Since the program's inception, Toyota has issued a total of $2.25 billion in diversity and inclusion bonds, a key component of the program's strategy. 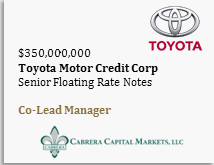 Cabrera Capital was a co-lead manager on Toyota Financial Services' $350 million Diversity and Inclusion Bond Offering.